I thought I would write a blog about Wet Age-Related Macular Degeneration (Wet AMD) and what it is like living with this condition, with a view to raising awareness about it. I’m not an expert on the condition itself, other than being an expert in how it affects me personally ! In writing this blog, I’ve borrowed heavily on information provided by the Macular Society (www.macularsociety.org) of which I am a member. Their leaflets give some very good explanations of the condition itself and also about a variety of related topics – more information about the Society will be given in a future blog instalment. 2 – What is AMD? The macular, which is about the size of a grain of rice, is located in the retina at the back of the eye. It gives us our central vision, much of the colour vision and also the fine detail of what we see. It also has a very high concentration of photoreceptor cells – these are the cells that detect light – they send signals to the brain which then interprets them as images. The rest of the retina processes our peripheral vision. Although there are different types of macular disease, they all make eyesight blurred or distorted, resulting in progressive and sometimes quite severe gaps in, or loss of, central vision. It isn’t painful and affects the vision used when looking directly at something, for example, when reading, looking at photographs, using the computer, watching television etc. I have Wet Age-Related Macular Degeneration, which is one of the two types of AMD. It occurs quicker and is more aggressive than the dry type – abnormal blood vessels grow in the retina, which then bleed and scar the macular – this is what causes the rapid loss of central vision. Wet AMD can be treated with injections of Avastin ,Lucentis or Eylea in the affected eye – I am having Eylea injections in my left eye. Although Wet AMD can be treated, it cannot be cured. 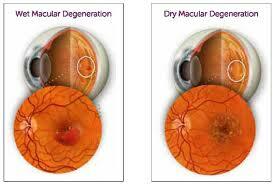 Dry AMD involves slow loss of central vision over a number of years and there is no treatment for it at the moment. However, Roche are currently undertaking phase three trials of a potential treatment – lampalizumab. Before I had my first Eylea injection, the doctor told me that about 30% of people who had the injections noticed some improvement in their sight (this would be over a varying number of injections). For the vast majority of people, the injections stop the sight getting any worse, but in a small number of cases, the injections actually make it worse – but then there is always an element of risk with any procedure. He did say though, that if I didn’t have the injections, my sight would definitely get worse anyway. I have had Wet AMD in my right eye for a number of years and for a few months now, in my left eye too. I can’t have injections in my right eye as there is too much scarring, although I did have Photodynamic Therapy (laser treatment) several years ago when the Eye Infirmary was at Chapel Ash in Wolverhampton. This entry was posted in Blog on November 20, 2014 by penval. Shropshire Disability Network is a Registered Charity Number 1148256.